Last summer my husband surprised me with a day trip. I was not told where I was going. I was just told what time we had to leave, how long of a drive it was, and what type of clothing I should wear. It drove me crazy not knowing where we were going. I'm a girl who likes to plan! So you can imagine my surprise when I found out we were going to a zoo WAYYYYY up in northern Wisconsin where there were not any major cities. "What kind of zoo could be in a town so small?" I wondered. 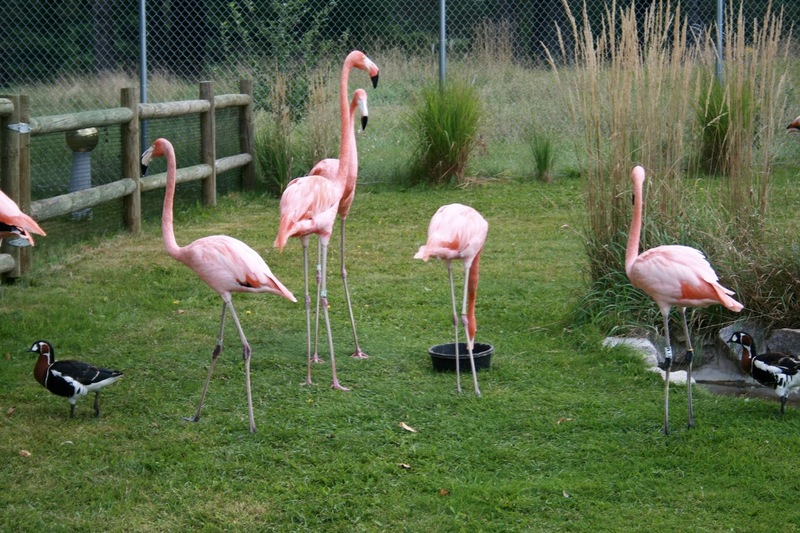 I quickly discovered, that this was no ordinary zoo. 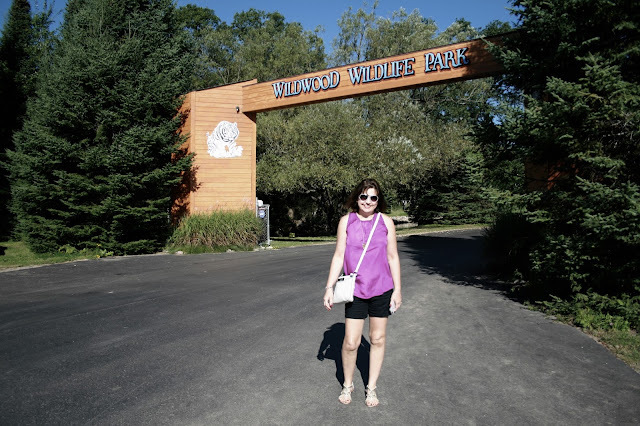 Wildwood Wildlife Park is the second largest zoo in Wisconsin (the Milwaukee County Zoo is the largest). If I could describe it in only one sentence I would say it's a petting zoo on steroids. It is home to 1000 animal species from the smallest insect to large animals like zebras, tigers, and giraffes..
Because it is a private zoo, it is quite costly in comparison to most state/county zoos. The cost of admission for an adult is $19.99. A child's ticket is $14.99. And we paid $8.00 for two bags of animal feed, but they also have the feed available in coin slot machines. 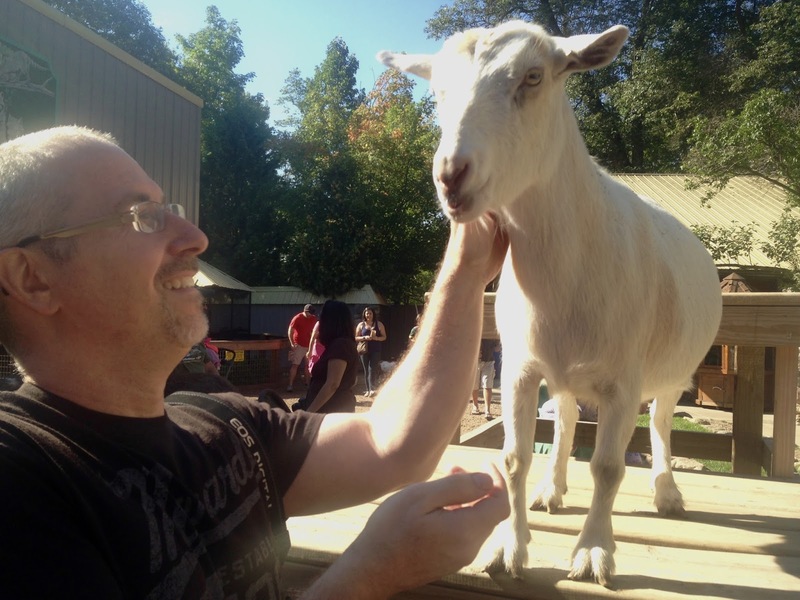 We arrived right when the zoo opened and the first creatures to greet us were the goats. Let me tell you, these guys were so happy to see us for they were ready to eat! They walked right up to us and we were thrilled to pet them and feed them. I loved this goat stand in the picture above. It had steps and several platforms and heights. The goats loved to climb up and stand on them or lay down to sleep. We were so blown away by the all the different animals freely walking around that you could pet and touch. 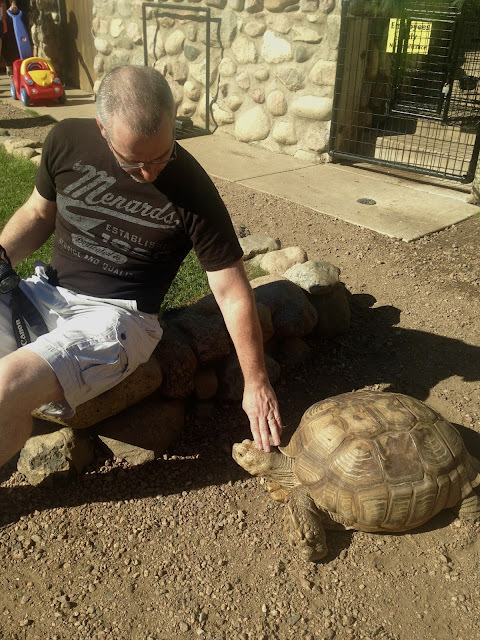 We absolutely adored this sweet tortoise. He was so gentle! He just hung out in the same spot all day and seemed to really enjoy all the attention the guests were giving him. He loved to be petted. I wondered why he didn't snap at anyone, especially the young children. He was so inquisitive and loving. I mean, what other zoo do you know of where a large turtle is just wandering around and you can pet him? 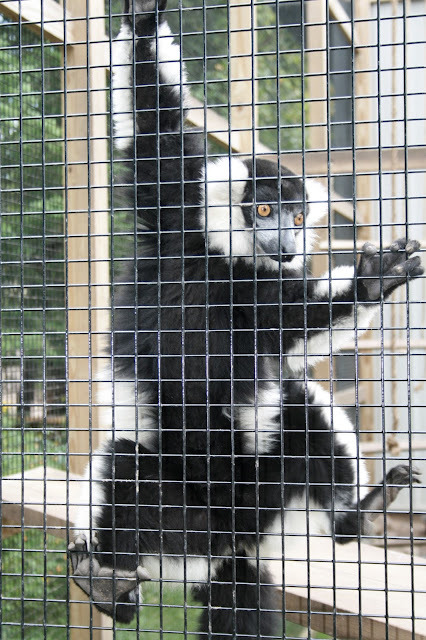 If you look up this zoo on TripAdvisor you will see everyone comment about how much their children enjoyed this zoo but it bothered some people that the animals were in cages. Yes, it's a small zoo, so they don't have the open large spaces major zoos have, but I felt that these animals were very happy, well taken care of, and loved. 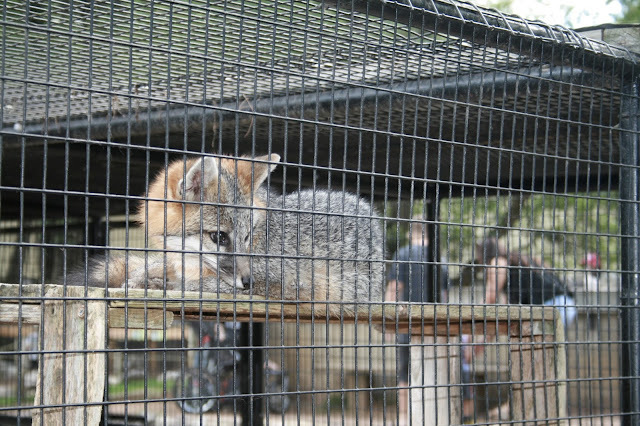 We saw so many employees lovingly taking care of these precious creatures. Just look at the faces of both the caretaker and the skunk below....I can't tell who loves who more. 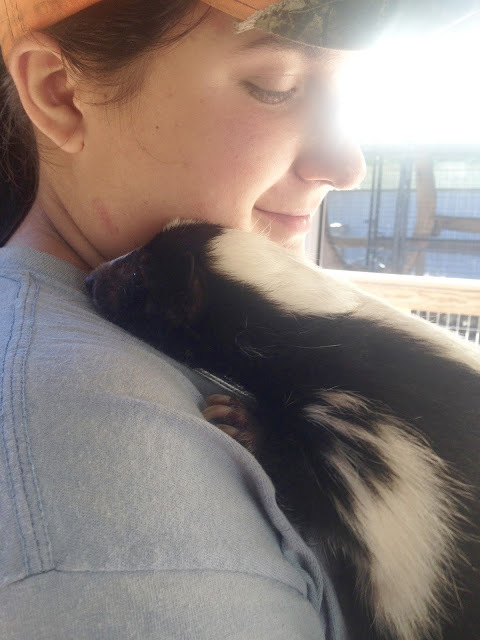 Look how the skunk is just snuggling her neck, my kitten loves to do that to me! All the visitors were allowed to pet the skunk while the caretaker held him. My husband was so excited. He said "I never thought I'd ever be able to pet a skunk!" 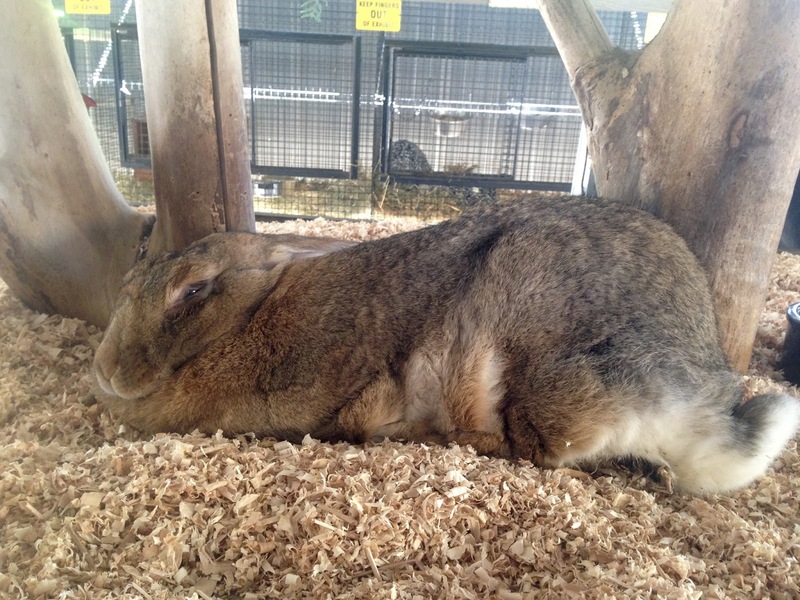 This big furry bunny was just hanging around in the open shade. He let anyone pet him. I couldn't believe how soft his fur was. 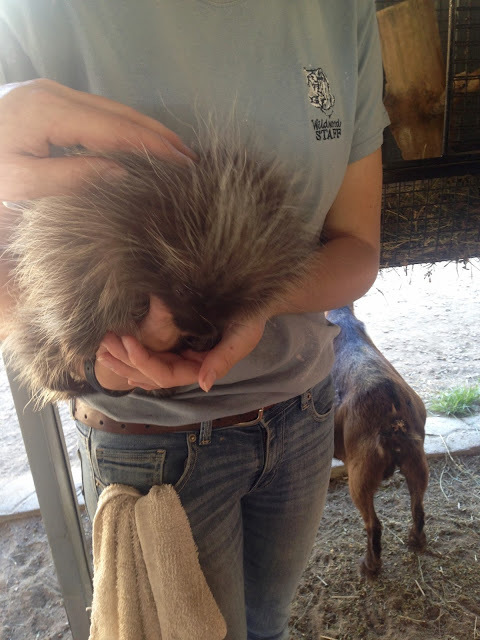 And who would have ever thought you could pet a porcupine? But you can, and surprisingly his fur was very soft. 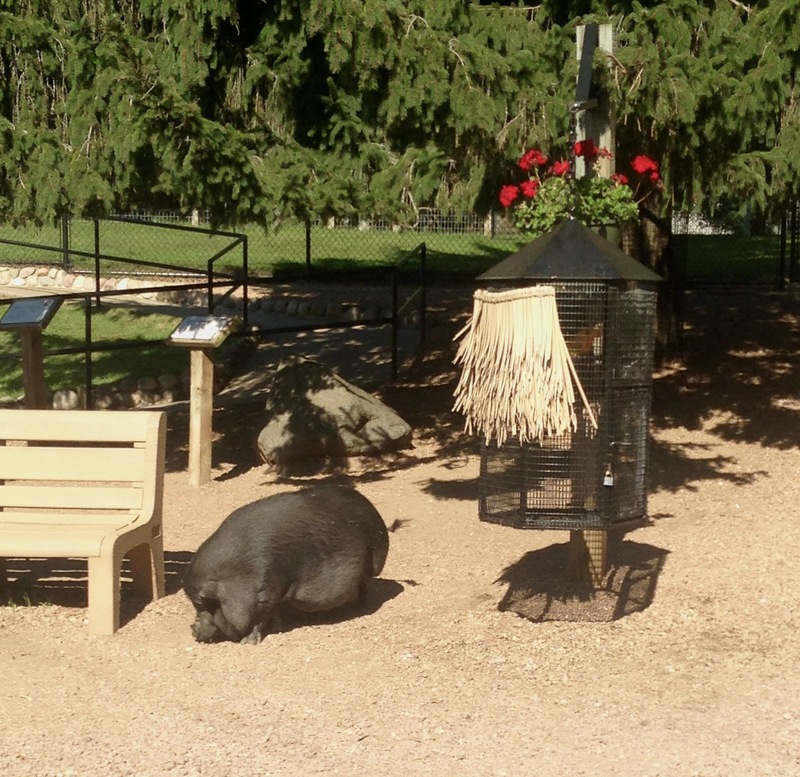 There was even a pot-belly pig roaming around. My husband got such a kick out of him. 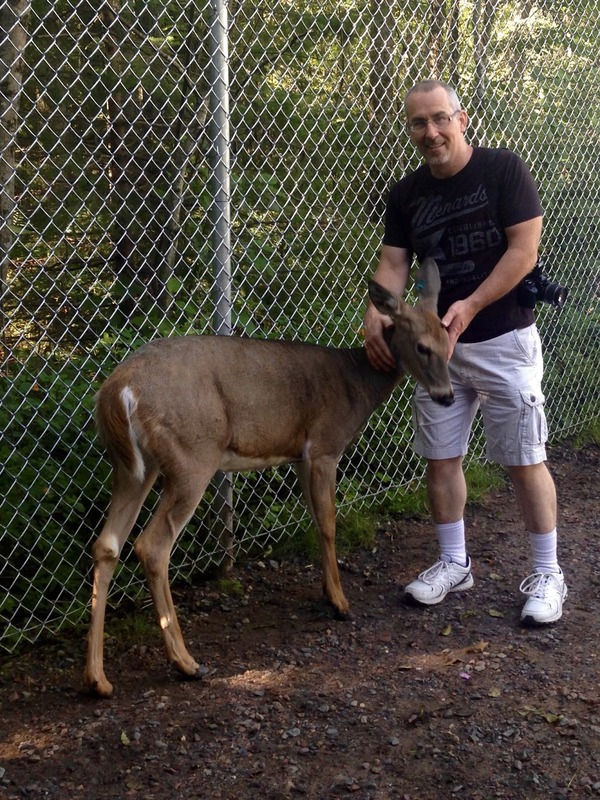 But perhaps my favorite animal to pet other than the bunnies was the deer. Oh, they had so many deer! 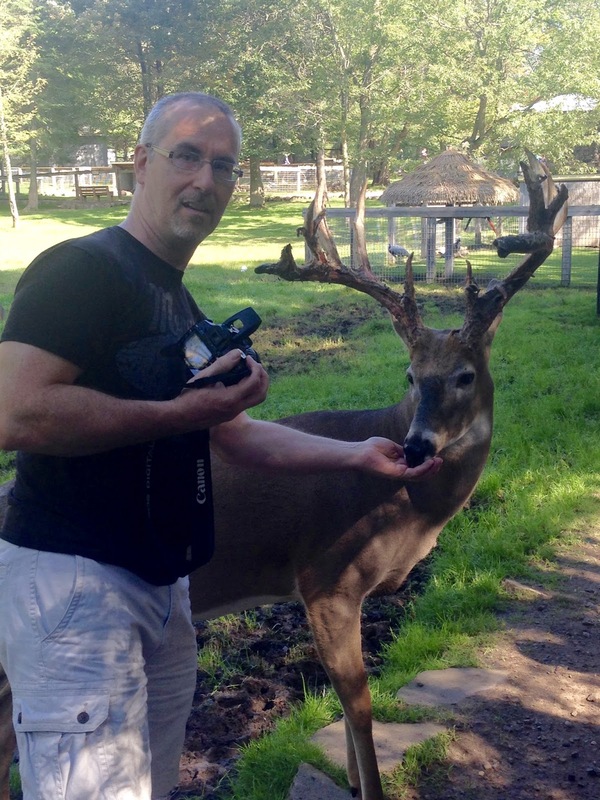 The deer roam the park freely, they are not in cages, just the fence that surrounds the entire property. They have a large grassy area where people are not allowed (there are signs that it is their resting area and to stay out). If the deer want food or attention, they come up to you. My husband was so excited to see this beautiful buck! And here is a short video of me feeding one of these gorgeous creatures and teasing all the hunters back in my home town. We fell in love with this beautiful "wolf". He reminded us of our favorite dog we used to have. I put "wolf" in parenthesis because he seemed as gentle as a dog. 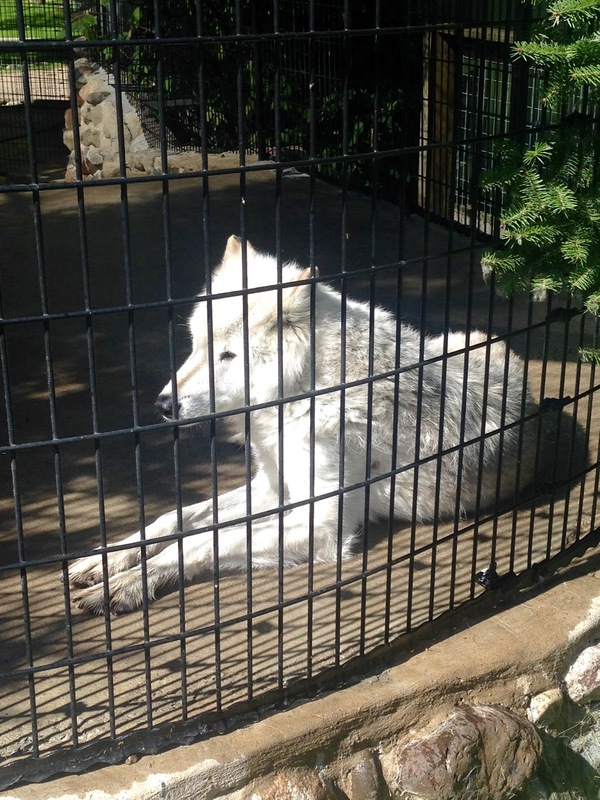 An employee was in the cage with this wolf and another, and they acted like puppies around her. 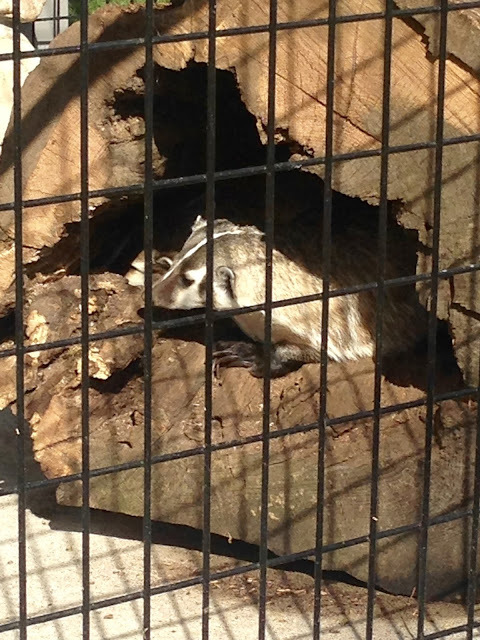 And what would a Wisconsin Zoo be without a Wisconsin Badger...our state animal! As I said earlier, all the animals seemed so happy to be living in this zoo. We got such a kick out of watching these river otters play in the video below. 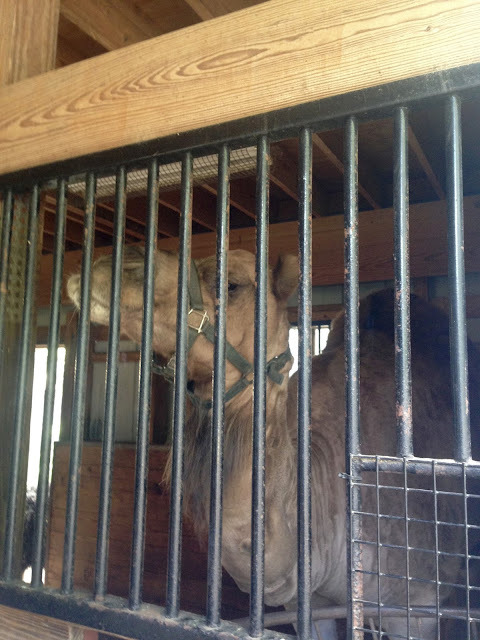 This camel did have an outside area, but he seemed to want to hang out in his inside home when we were there. I couldn't believe we could get so close to him, touch him, pet him, and feed him. I always thought camels would bite, but he was so gentle. They did have a few larger animals like this tiger, that you couldn't get close too as there was a rail, a patch of ground, and then the cage. 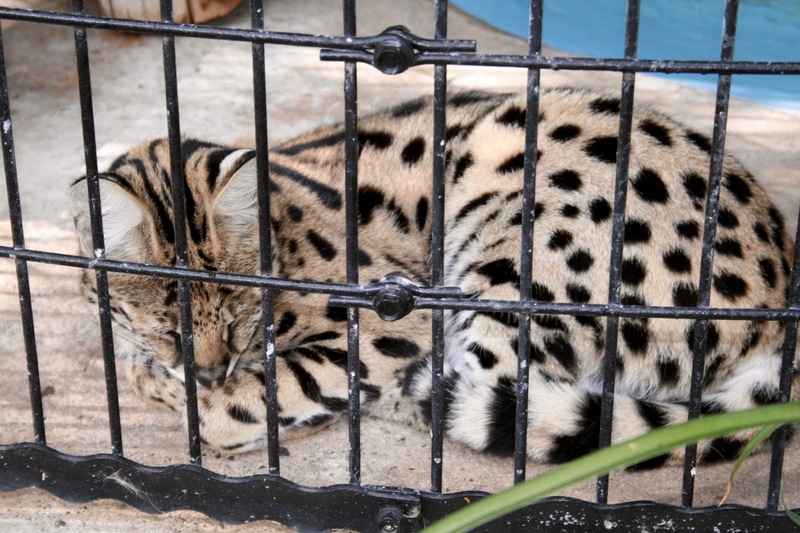 There was also a regular colored tiger sleeping in the background and a cougar and black panther (not shown) in a separate cage. My were they beautiful! But, you could get close to the bear; in fact, you can even feed them! They sell "Bear Juice" for $3.00 a bottle, you just hold it up to his cage and he drinks it right out of your hand. My husband reached out and touched his claw, and the bear made an interesting clicking sound that you can hear in the video below. I'm thinking, he didn't like being touched, but it was so cool that you could get close enough to touch his claw. We've never gotten this close to a bear at any other zoo we visited. 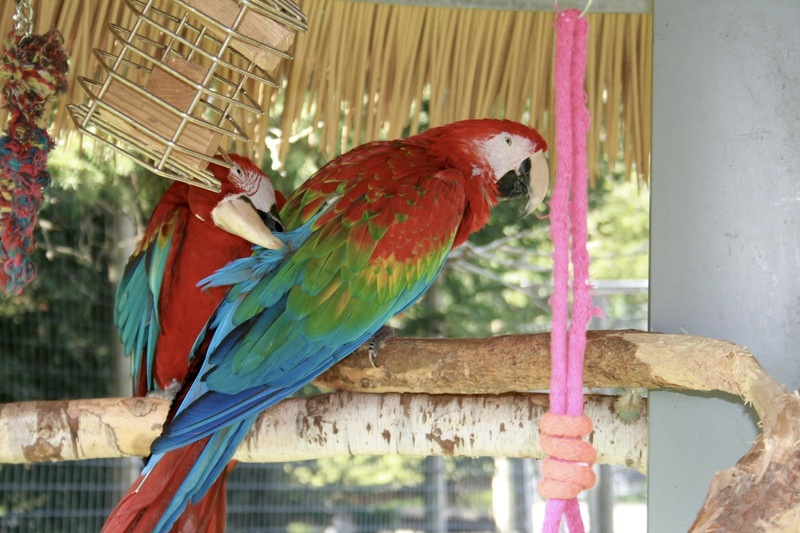 Well any regular reader of my blog knows that I love birds, and they had so many beautiful birds to adore at this park! 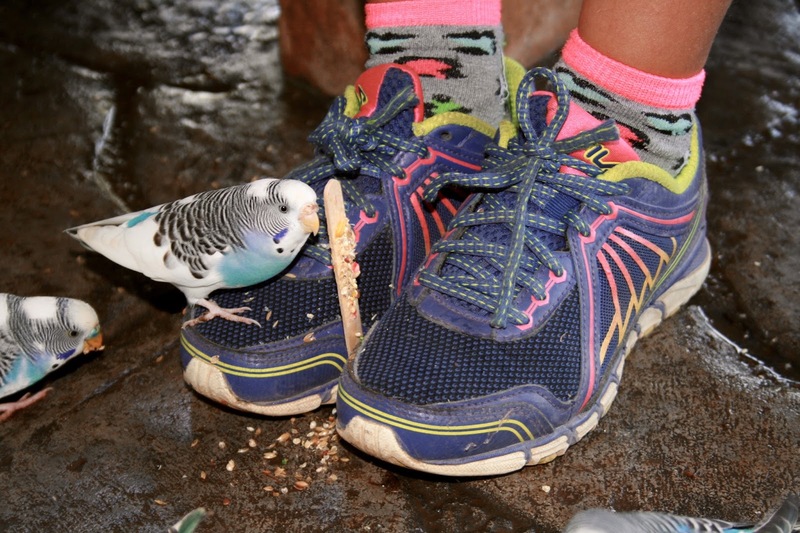 We especially loved this parakeet hut where the birds fly freely and you can feed them right out of your hand. You do have to pay extra to get a feeding stick like the one between the child's shoes below. This video pans around the hut a bit so you can see how they live, how many birds there are, and hear them sing. 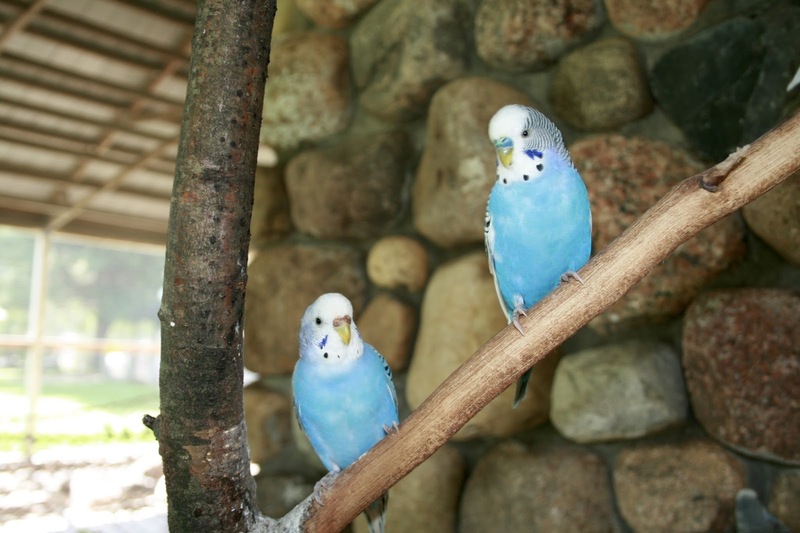 I just love these blue parakeets. 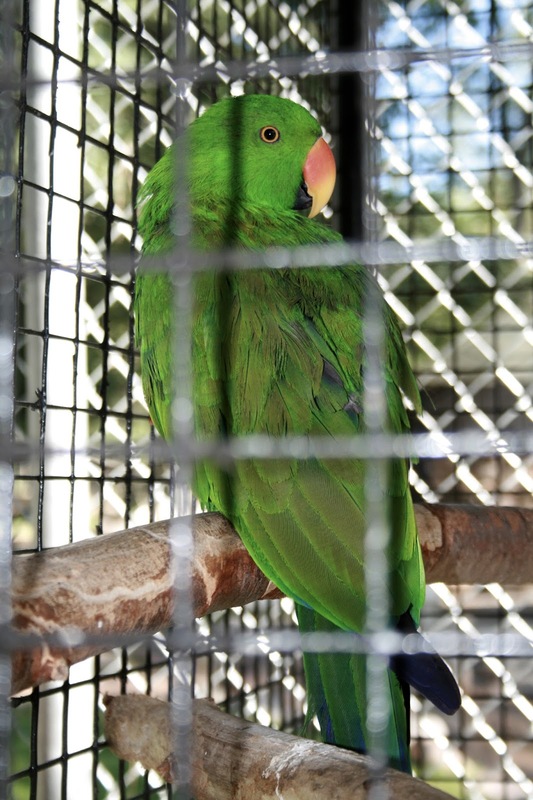 And there were so many different kinds of parrots too! The zoo did have giraffes that you could feed as well for an extra fee. At this point in the point it was lunch time, so we got some food at the "Jumbo Hut" and sat on a bench nearby to eat our lunch and watch the giraffes. The grounds of this park are absolutely gorgeous and well maintained. 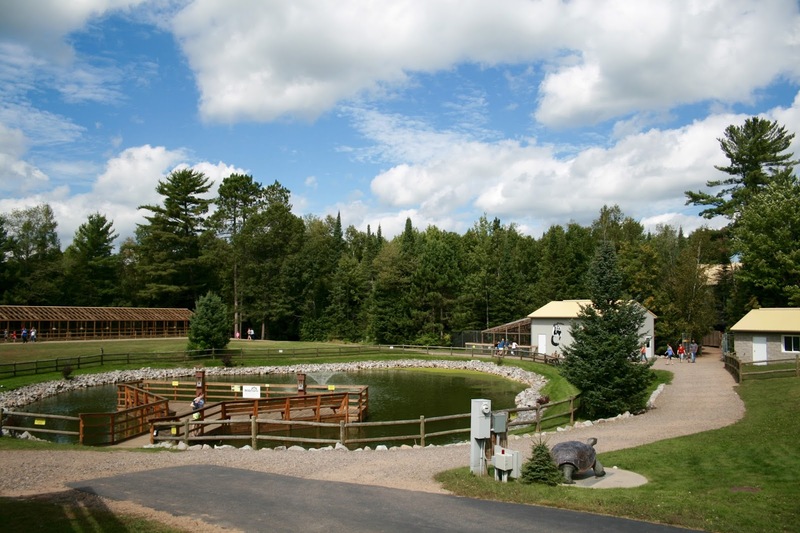 There are several educational centers: an amphitheater where they have daily programs to learn more about the animals, a primate and reptile center, a Living History School House featuring artifacts and information about the educational system in the nineteenth century, and the William E. Gardner Educational and Events Center. This building is located in a gorgeous area of the park where there is a large pond, water feature, and many beautiful water animals. There's a fun kid's play area here called "Dino Dig Adventures". This is basically a giant sand box for kids to dig for dinosaur bones. 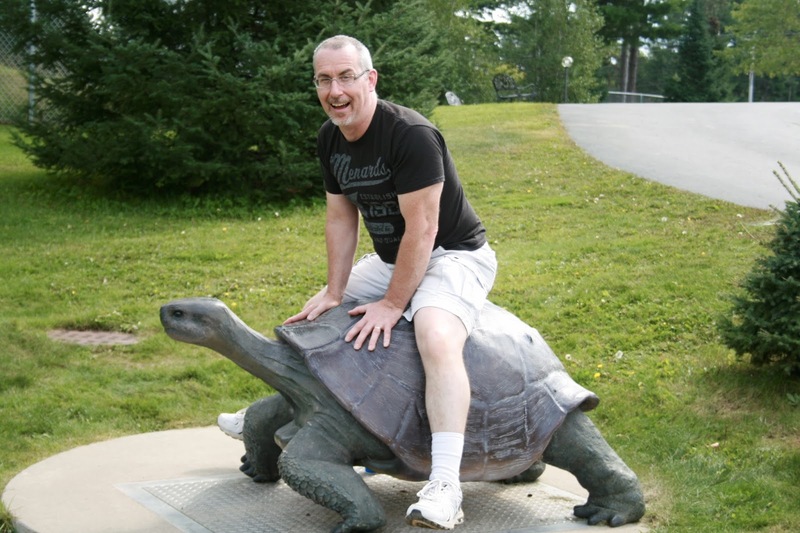 There's lots of cute animal statues here too like this tortoise! 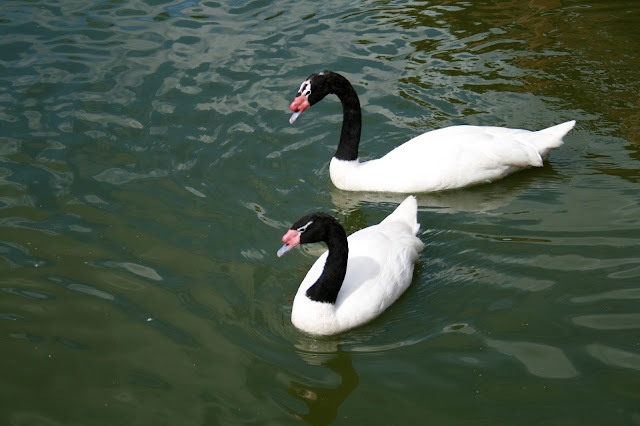 The pond is filled with koi and so many different types of waterfowl. The building to the far left contains all sorts of birds. These little creatures were so entertaining. Some other guests were feeding them grass and they were "stealing" each other's grass from each other. It was so cute to watch. Such tricksters they were! I absolutely love foxes. I recently was awestruck when I saw a fox in my yard...even though I live in the country, that was the first time I saw a fox in my yard in twenty years. I was pretty excited. Isn't this fox just precious? He was napping and my husband stuck a finger in his cage to pet him and he woke up. That's when I snapped this cute picture. Look at this beautiful bobcat. Such a pretty kitty. 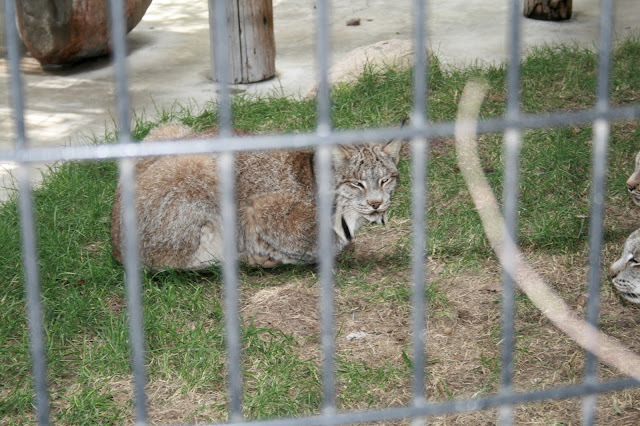 And lastly, this lynx. I always loved their interesting faces. We saw so many other animals at this park, but if I share every picture it would be a very long, long post. I hope you hung in there to the very end...I know it was long. 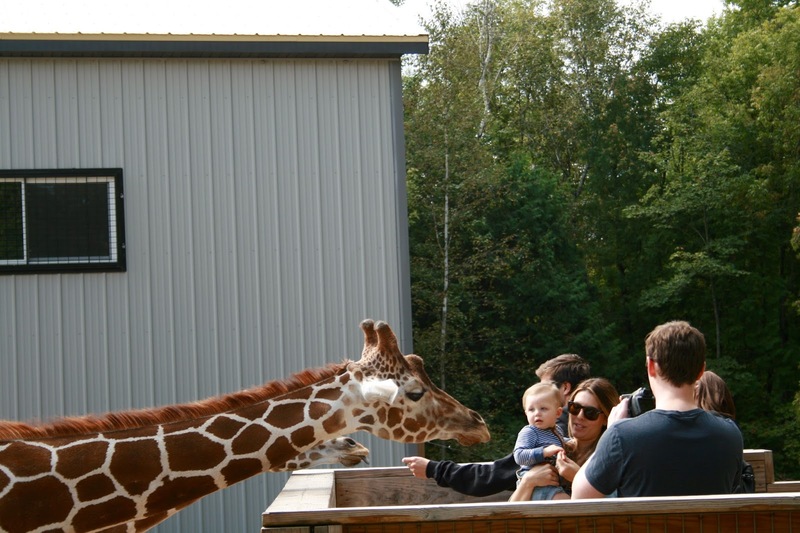 I really can't recommend this park/zoo enough, especially if you have small children. My husband and I always try to visit zoos of major cities whenever we travel, and they are all different and special in their own way; but this park is the most unique because it offered so many interactive opportunities with the animals. It was such a happy, happy day for me. I think I laughed and giggled all day long. And I saw so many happy children as well. Animals are so precious, they are God's gift to us to enjoy and take care of. And perhaps, that is why I enjoyed this park so much, because instead of just seeing animals from a far away distance, I got to pet them and love on them, as well. Sounds like a wonderful outing! I love petting zoos. And how great that your husband surprised you and kept the destination a secret! Thanks Andrea! It was such a fun day, looking at these pictures and videos brought back so many wonderful memories! OH my boys and I just love visiting zoos! This looks like such a wonderful zoo with a wide variety of animals to see. Your boys would love this zoo! I totally understand! I believe a lot of these animals are rescue animals, and I do think Zoos are so important not only for education but also for appreciation. I don't think children would value and respect animals as much if it weren't for zoos. 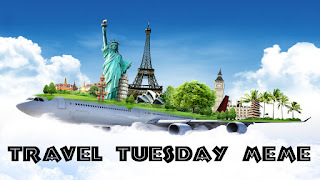 How sweet of your hubby to plan a surprise trip. Looks like you had a blast! Thanks Amy, we did have so much fun! Wow, what an experience! These pictures are amazing! So many fun adventures you go on! How fun that your hubby planned such a great outing! Thanks Ruth! 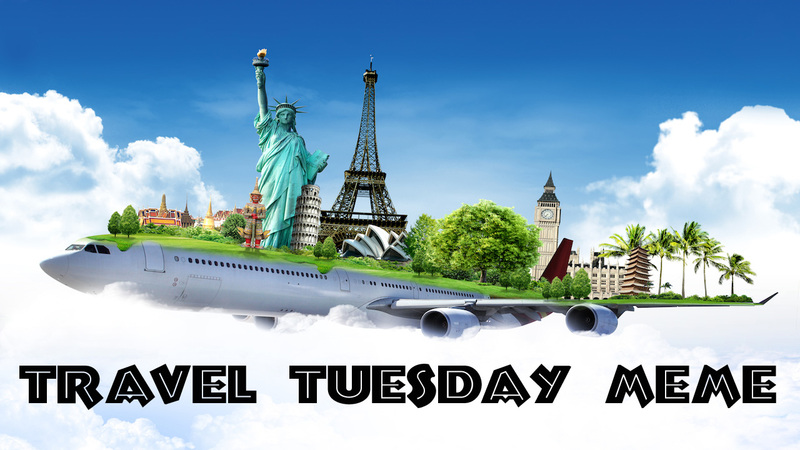 Traveling is one of the few perks of growing older. Fantastic shots, Amy! I love visiting places like that and seeing first hand all those marvellous creatures.